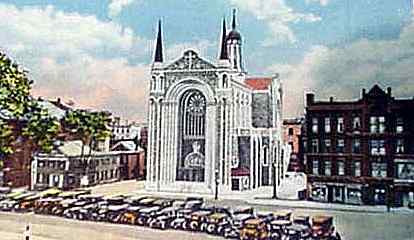 Notre Dame des Canadiens at Salem Square was the mother Catholic church of four French-speaking parishes. It began in 1869 where Bancroft Hotel stands today. When a fire burned that church down, the land was sold to a Baptist Church where the Notre Dame patrons worshipped until the present church was constructed in 1929. The Parish was founded by Father J.P. Primeau. The church was rededicated in 1953 following rennovations carried out by Monsignor Barrette. The following are links about Notre Dame Church you may find interesting. Also check out the other pages. The following are comments left about Notre Dame Church from site visitors such as yourself. They are not spell checked or reviewed for accuracy. Interestingly enough, had the construction of the present-day cathedral been delayed, it probably would not have been finished. Luckily, it was finished just before the Great Depression. Before the center was built, the church was on top of a slooping hill that ran from Franklin St down to front street. The bus terminal was at the bottom of the hill. All that was filled in when the bank building, and center was built. Notre Dame was also home to our/my Boy Scout Troop 39. Meeting held in the huge basement with tons of room for fun things/games/activities. Morse code in one area, tying knots in another, marching in another, scout rules and handbook in another area, etc. In the 1960s Notre Dame was a regular place place of prayer for family members after a day of shopping in the stores of downtown Worcester (esp Denholm on Main St. I fondly remember the side aisles filled with hundreds of flickering candles. Many of us were heart-broken when the main altar was "removed." Would love to know what became of it. My fear is that it was destroyed, given the spirit of the day. In college, I befriended twin tall Somalian women and went with a Christian girl to the basement graduation party for them. It was fun. Another time, I met with seemingly other-wordly (not of this world) priest and they recounted the entire Christ story to me from beginning to end. I told them I saw shadows on my wall once and they then said to themsselves, "He's not the one we're looking for." The carnival for Worcester kids is held near their parking lot, or was. And now the Diocese has sold this grand church for $800,000 to an insurance company. Shame. This church would cost millions to build! Why not sell the Chancery Building or Bishop's west side mansion? I have heard this church will be demolished if a use for it is not found - Is anyone interested in pursuing a new mission ? Being from a French Canadian background I would love to keep this heritage !! It would be a shame to demolish such a historic building... I hope they will preserve it. Wonder what became of the furnishings...organ, windows, etc. other than just "passed to other parishes"...suspect the funds ended up in the coffers of "Irish-American" clerics/bishops. Notice how their parishes aren't closed! Perhaps the Worcester Museum could purchase it and make it an annex...perhaps dedicated to religious art. Does it still sit in limbo? Are the Catholics even concerned? Will this become another downtown Worcester parking lot for cars with no stores to visit? The church is owned by the developers of CitySquare. The diocese no longer owns it. Hopefully the developers will make sure it stays and is kept up. It would be a shame to lose that lovely building. Would love to see an accounting of what was sold and the price. Where did everything that was stripped from the church disappear to? They say it was redistributed to other churches/parishes: then tell us what went where. Suspect stained glass etc. was sold cheap to enrich diocesan coffers or pay abuse law suits. Call me a cynic. Notre Dame was my parish. I was married there by my cousin Rev Father Charles Belanger. I left Massachusetts in late 60’s. I now live in Florida and I long to hear what is being done with the church. Such a lovely edifice. I went to Holy Family School where we had many plays and gatherings in the huge cellar of the church. I would love to hear news of this church. Would love to know what happened to the painting of my cousin, Rev. Fr. 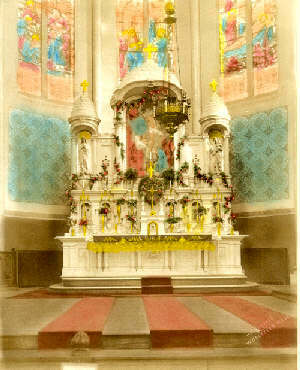 Charles Belanger, which hung in the back of the altar with all of the other paintings of former pastors of Notre Dame. I would love to have it for my family. He was dear to our hearts. Does anyone know? How much longer will this church stand? We need to move onto the reality that this is no longer what is was.Move forward,not backwards.Thank you for reading this thought. What is happening to the church? the construction is very close to the church now and the workers say that the church will be torn down soon. does anyone know or is it another one of the Worcester behind the door secrets of the past? Where are the stained glass windows and the inside the church art? were they sold off to pay for the misdeeds of the priests and the coverups? silence yet another family or media source? do people understand that when history is torn down, it is soon forgotten and people forget even what was there in the first place. consider the church on main street where clark is now putting a parking garage. does anyone really care? didn;t think so. make your voices heard. hard to silence thousands of complaints. a few hundred get swept under the carpet. thanks for listening. I was baptized in this church 60 years ago, and have not been back since then. I was hoping to revisit it. Don't give up hope yet!! There is a group working to keep the church from being demolished so a reuse plan can be developed. Save Notre Dame Alliance on facebook. Like them, pledge if you can. Especially if you have a personal connection to the place!! I moved to Worcester 2 years ago and it kills me to think this building will be torn down so a square, boring block can up instead? Don't Bostonize Worcester! Save Notre Dame! I was horrified to hear of plans to demolish the Notre Dame Church in Worcester. This building is historically significant to the French Canadian Community and should be preserved at all costs. The architecture, stone work and scale of the building is a standing work of art and worthy of preservation for future generations. We must not allow this architectural gem to pass through our hands but demand it to remain in place for all. time. Again, more luxury apartments. This was done to Holy Trinity German Church in Boston. Have these Cardinals no shame? Since Vatican II they have been selling the Church off to Protestant endeavors and cults, meanwhile it’s business as usual in the Braintree conglomerate. Shame be upon them. I read while researching my family tree that my GR8-grandfather, Marcus Grenon was the founder of this church. They make no mention of this except in his obituary. I would love to see a photo of him! Anyone?!? !